What’s new at Chasen Antiques? Our five-show-Southern-circuit is around the corner, with the first starting in Miami on January 24th. This is the time of year when I scour the earth to find treasures. I’ve been a busy boy. There’s always luck involved and this year it’s been good. A large proportion of my new items are from private estates. Following is a sampling. I suggest you check out my website where I’ve listed some of them, but there are many I haven’t yet listed. Call 516-922-2090, or send an email by clicking here, if you’re looking for something specific. (Remember to answer the simple anti-spam question at the bottom of the form or your email will not be sent.) Thursday’s post will be part II of What’s New at Chasen Antiques. 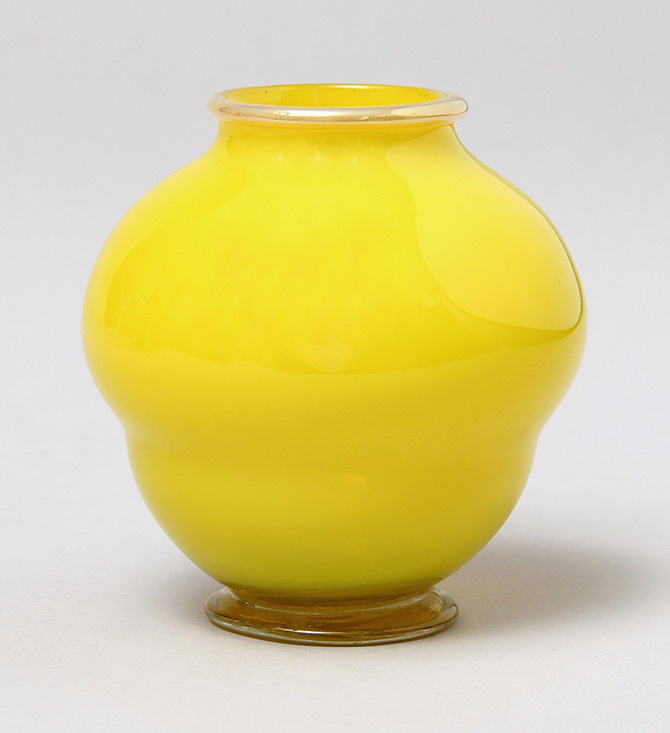 Tiffany Favrile glass is one area where I’ve purchased some very fine items, including a rare yellow vase, pictured above, a black millifiori vase, a turquoise decorated mini vase, a hearts & vines vase, a red-orange vase and several other outstanding examples. 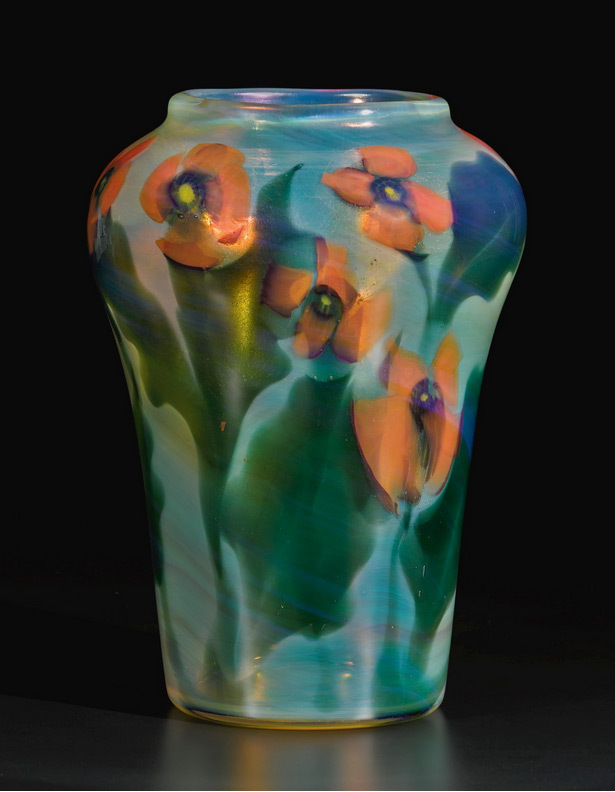 I don’t get many Tiffany Favrile pottery vases because they’re even rarer than Tiffany Favrile glass. 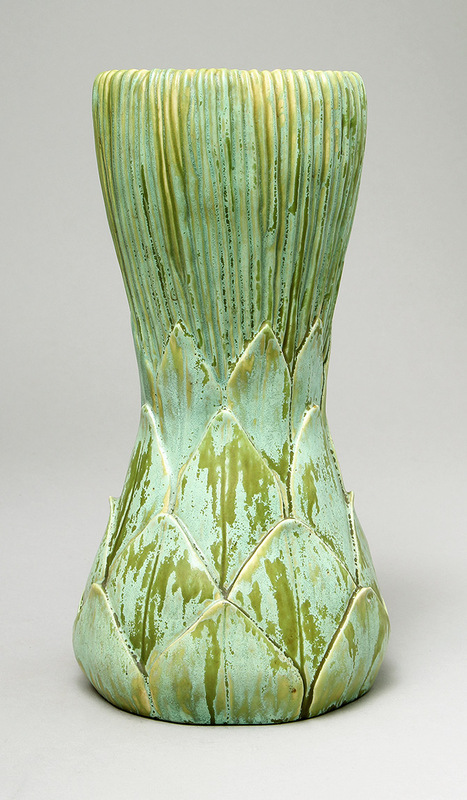 I just bought a wonderful, big (11″), artichoke example with a great glaze. Another item I rarely get is Natzler pottery. If you don’t know, it’s mid-century and the best quality. 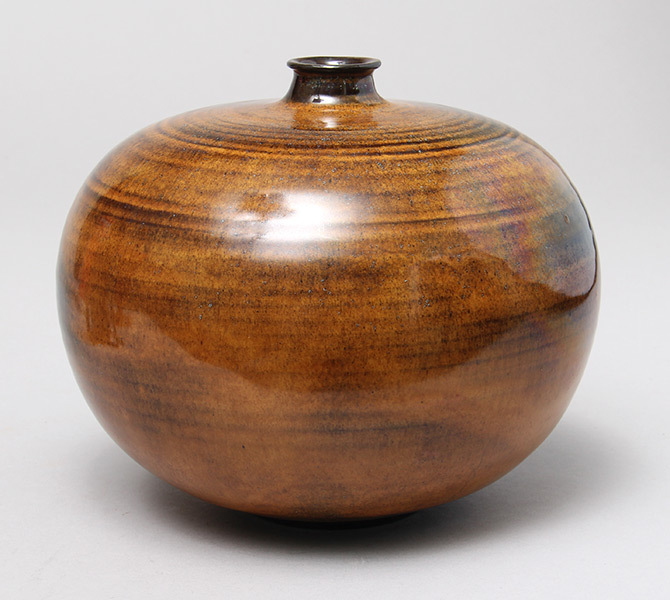 This example has a great Tiger Eye Reduction glaze, with the original stickers, including the original price. A very cool item! I’ve only touched the tip of the iceberg. Look for more this Thursday. In the meantime, please check my website. I think you’ll like what you see. 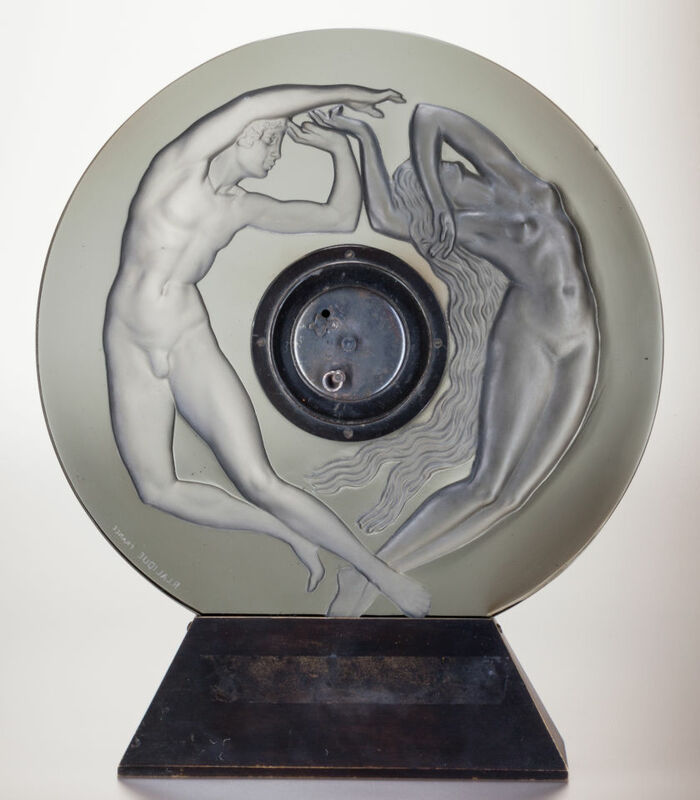 Bonham’s New York held its 20th Century Decorative Arts auction on Tuesday, December 16, 2014, a day ahead of Sotheby’s. The sale was fairly small, with total sales of $1,136,534, for the 95 of 166 lots that sold. Many of the unsold lots were radios, which skewed the results. Tiffany lamps were a large contributor to the total. Leading the sale was a beautiful Tiffany Floral Bouquet chandelier, which easily exceeded its high estimate of $120,000, realizing $197,000, including buyer’s premium. 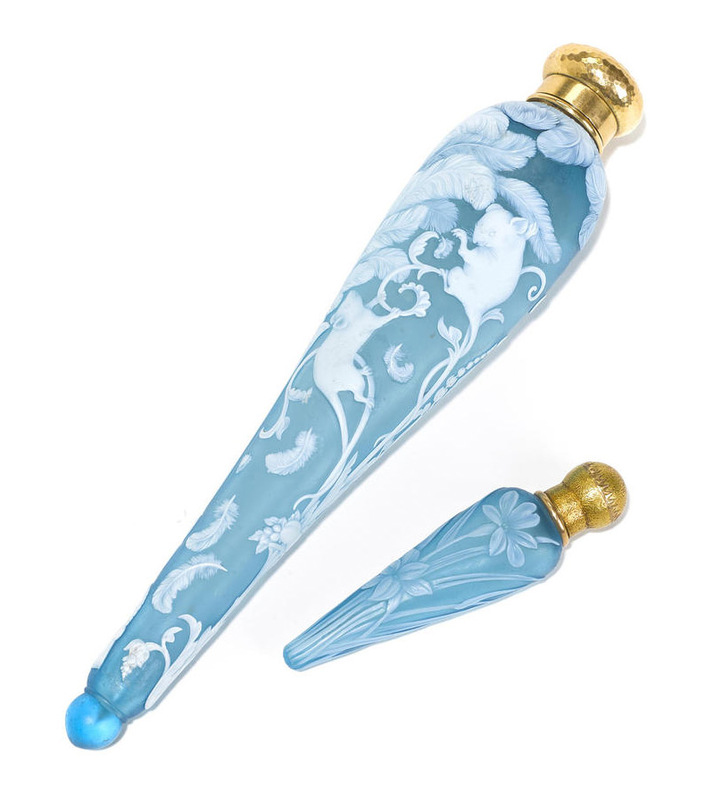 Lot #7, two Webb lay-down perfume bottles, was a nice surprise. It soared past the pre-sale estimate of $1,500 – $2,000, to realize $21,250, including buyer’s premium. To be fair, the pre-sale estimate was quite low, and the quality was high. Mice are rare subject matter, the detail was superb, and the lids were 14K gold, instead of the usual sterling silver. 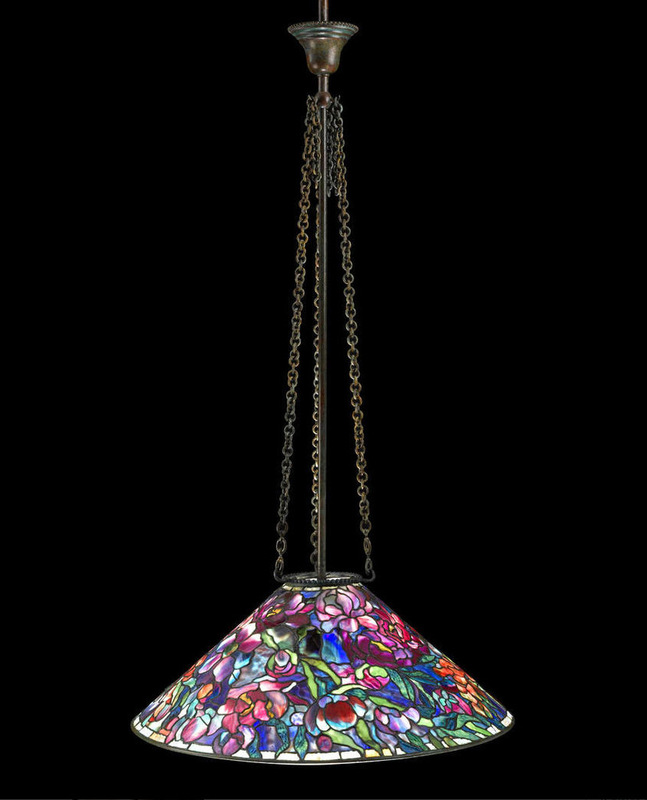 It was nice to see two sales in a row where Tiffany Studios lamps and glass sold well. It appears that the poor results at Christie’s sale were just an anomaly. I’ll be spending the next month looking for treasures to bring to Florida for our southern circuit. So far the buying has been great, so look for lots of new goodies to be listed on my website soon. The Florida shows begin with the Miami National Antiques Show on January 24, 2015. Sotheby’s New York held its Tiffany: Dreaming in Glass auction yesterday, December 17, 2014 with total sales of $6,585,875. 36 of the 41 lots offered sold, for an average of $182,941. 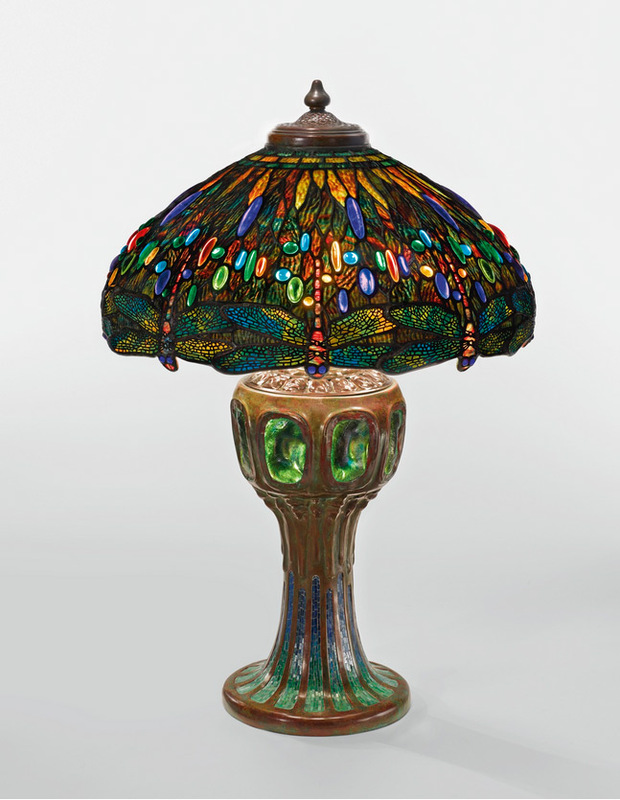 Most of the Tiffany lamps sold near or above their high estimates. Leading the sale were two nearly identical Tiffany Wisteria table lamps, selling for $1,145,000 and $1,205,000, respectively. Both were outstanding examples. 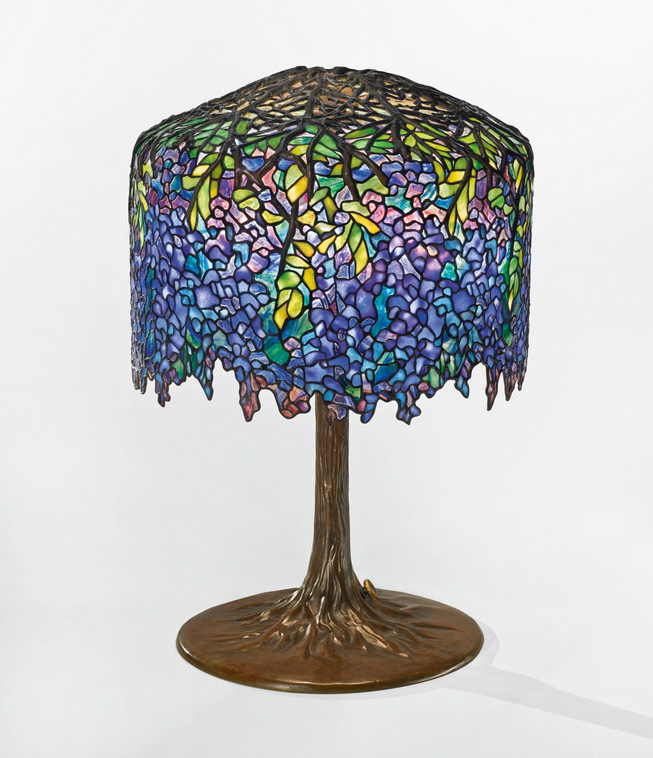 The third best-selling lot of the sale was a Tiffany 22″ diameter Drop-Head Dragonfly table lamp with a vividly colored shade and an important mosaic and turtleback glass base. The lamp sold for $965,000, against a pre-sale estimate of $600,000 — $900,000. The top lot of the glass section of the sale was #207, a paperweight vase with Poppy decoration. It sold for $87,500, easily exceeding its high estimate of $50,000. 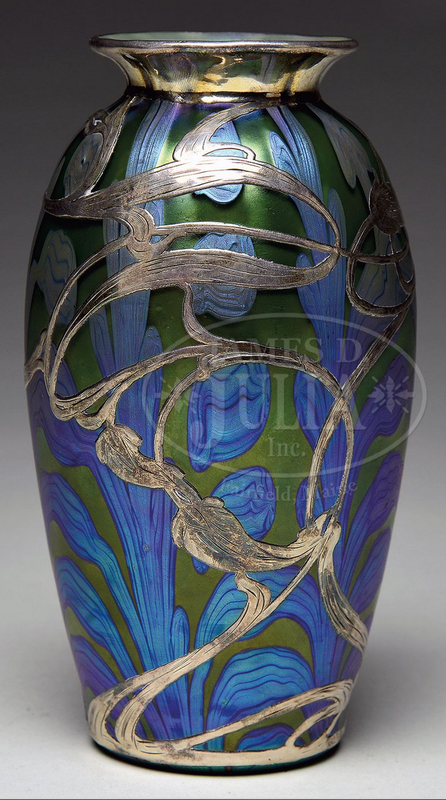 I won’t cover Christie’s Tiffany Studios auction of December 9, 2014. It was too depressing. I can’t begin to explain why Sotheby’s did so much better than Christie’s, but they did. You’re on your own for Christie’s results. I’ll be spending the next five weeks looking for treasures to bring to Florida for our southern circuit. So far the buying has been great, so look for lots of new goodies to be listed on my website soon. The Florida shows begin with the Miami National Antiques Show on January 24, 2015. 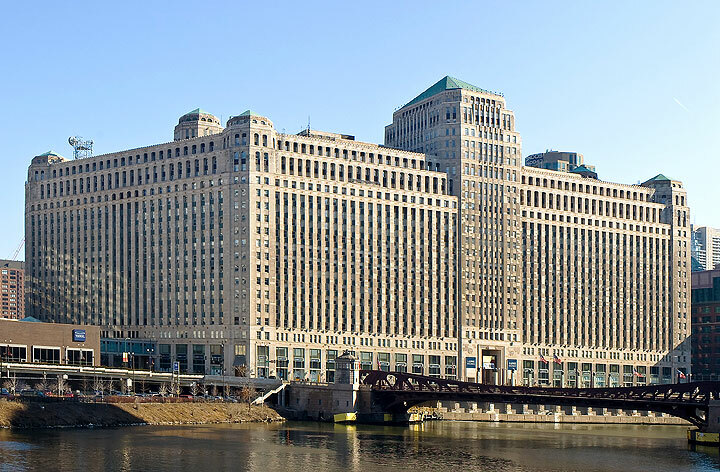 You probably remember there was no antique show at the Merchandise Mart this past April. It all started when the Palm Beach Show Group couldn’t reach agreement with the Merchandise Mart and went off on their own to create a show at the Navy Pier. As a result, the Merchandise Mart couldn’t get enough exhibitors for their show and shut it down. 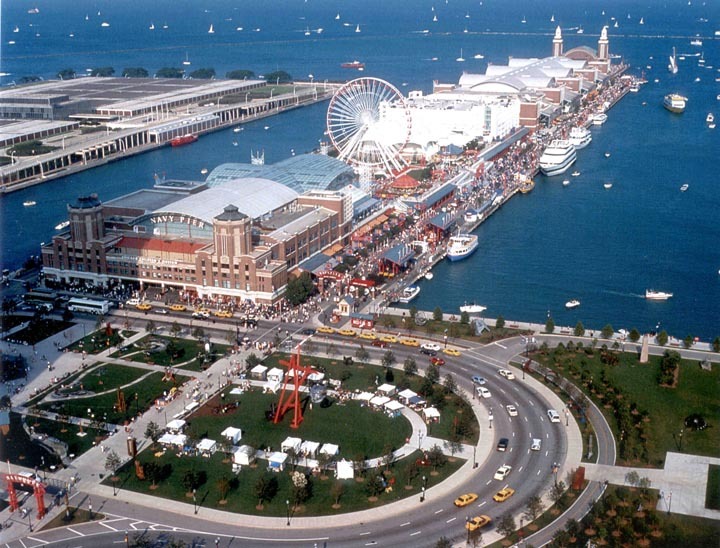 With higher expenses for the dealers and lower sales at the Navy Pier, many of the show exhibitors balked and did not resign for another Navy Pier show. So the Merchandise Mart is reluctant to start another antique show and the Palm Beach Show Group doesn’t feel like gambling on a second Navy Pier show. Where does that leave the dealers and the public? Between a rock and a hard place. It feels like a bad case of Humpty Dumpty — all the king’s horses and all the king’s men couldn’t put Humpty together again. Now everybody suffers. I know I feel it. Chicago is my best city. The fewer times I exhibit there, the lower my income — plain and simple. I’ve built up a great clientele there over many years and now there are very few opportunities to exhibit. There’s no more Arlington Racetrack, no more Rosemont summer show, and now no downtown show. UGH!! I spoke to one promoter who is looking for a downtown facility to host a smaller show, but who knows if that will become a reality. In the meantime, I’ve got to rely on only two shows in the greater Chicago area — the fall show in Winnetka and the Chicago Botanic Gardens in the spring. It’s frustrating when I have no control. I’ll be spending the next month and a half looking for treasures to bring to Florida for our southern circuit. So far the buying has been great, so look for lots of new goodies. The Florida shows begin with the Miami National Antiques Show on January 24, 2015. 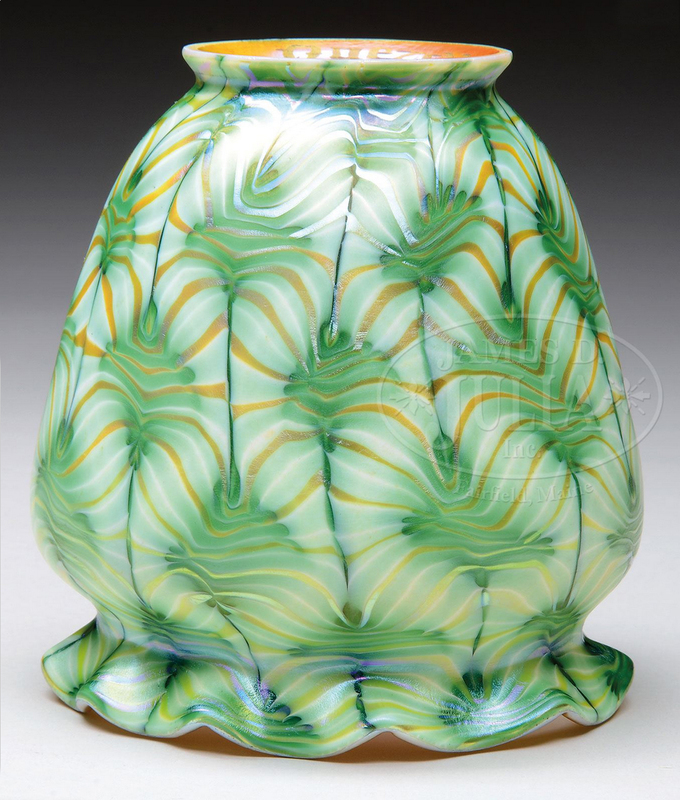 Heritage Auction held its Tiffany, Lalique & Art Glass auction on November 21, 2014, with gross sales of $1,441,233. Leading the way was a Tiffany Studios Border Peony floor lamp, Heritage lot #60031. It sold for $143,000, including buyer’s premium — about the mid-point of the pre-sale estimate of $100,000 – $150,000. The lamp was part of the Weider Health and Fitness Collection from Los Angeles, purchased in the 1970s. R. Lalique sold well, with lot #60229 being the top selling lot of the group, and the second highest selling lot of the sale. However, it’s final price of $47,000 was below its low estimate of $60,000. 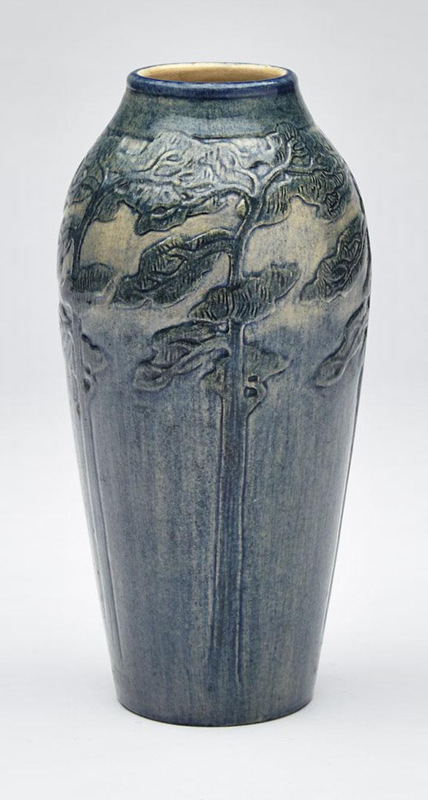 Other lots did better, such as #60217, a purple Borromée vase selling for $46,875, near its high estimate of $50,000. The top lot of the French cameo glass section of the sale was a pretty Daum Nancy Rain scenic table lamp. Selling as lot #60138, it too sold near the mid-point of its pre-sale estimate of $35,000 – $45,000, realizing $43,750. For the complete catalog, click here. You will have to sign in (free) for the results. Most people are aware that Tiffany Studios made lamps and many people know they made other items, including glassware and desk sets. But I suspect if you were to ask someone if Louis Comfort Tiffany designed jewelry, the answer would probably be “I don’t know.” or “No.”. Well, he did, and Heritage Auctions will sell a lovely example on December 9th. 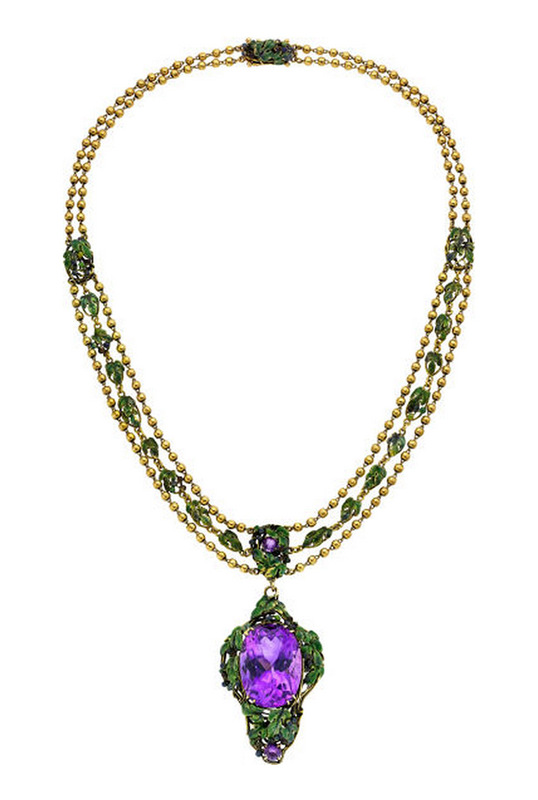 Lot #54124 in the Holiday Fine Jewelry Signature Auction is an amethyst, enamel and gold necklace, designed by Louis Comfort Tiffany, for sale at his father’s store on Fifth Avenue in Manhattan, Tiffany & Co. The necklace features a 35 carat amethyst, enhanced by several smaller amethysts, set in 18k gold, with enameled leaves and suspended by an 18k gold chain. It is marked Tiffany & Co. The pre-sale estimate is $30,000 – $50,000. In most auctions, the reserve is kept secret, but in this case Heritage revealed the reserve of $20,000. That means as soon as the bidding hits $20,000, the item is sold. It can stop at $20,000 or sky’s the limit. Anything less than $20,000 will mean the item will go unsold. It’s provenance will certainly help. It’s been passed down through three generations of New York women. It will be on public view in NYC at the Fletcher-Sinclair Mansion on E. 79th St. for several days prior to the sale. 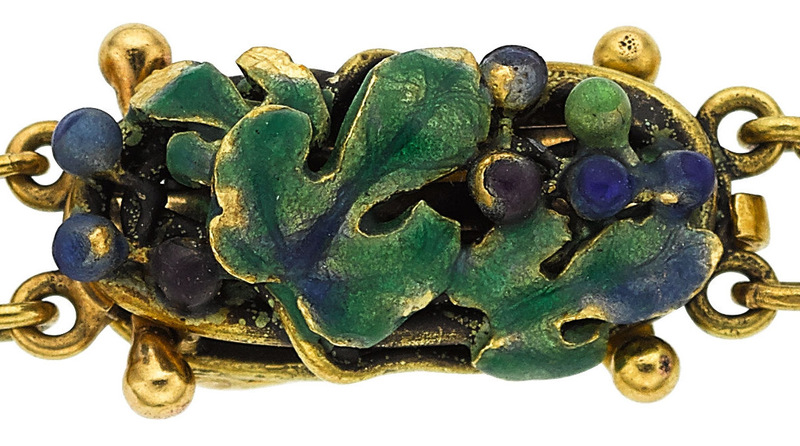 I’m curious to see what happens as I specialize in the works of Louis Comfort Tiffany, but never his jewelry. I’ll let you know after the sale. James D. Julia, Inc. held their Important Lamp & Glass auction on November 12-13, 2014, with total sales exceeding $1.5 million. Some categories showed significant strength, including Loetz glass, art glass shades and French glass. The sale started strongly with Loetz glass. This section of the sale was led by lot #2005, a beautifully decorated, silver overlay, vase. It sold near its high estimate of $12,000, realizing $13,035, including buyer’s premium. More than a few vases sold over $5,000 and over or near their high estimates. From a very hot market in art glass shades 7-10 years ago, the market went into its Rip Van Winkle period, asleep for many years. Now it appears that Mr. Winkle may have awoken. Lot #2334 was a beautiful, rare, Quezal shade with green and gold pulled decoration. Estimated to sell for $600 – $900, it soared to $5,628.75, including buyer’s premium — almost 10 times it’s low estimate. This shade may have been the highlight of the art glass shade section of the sale, but it was only the tip of the iceberg. Many shades sold well above their high estimates. 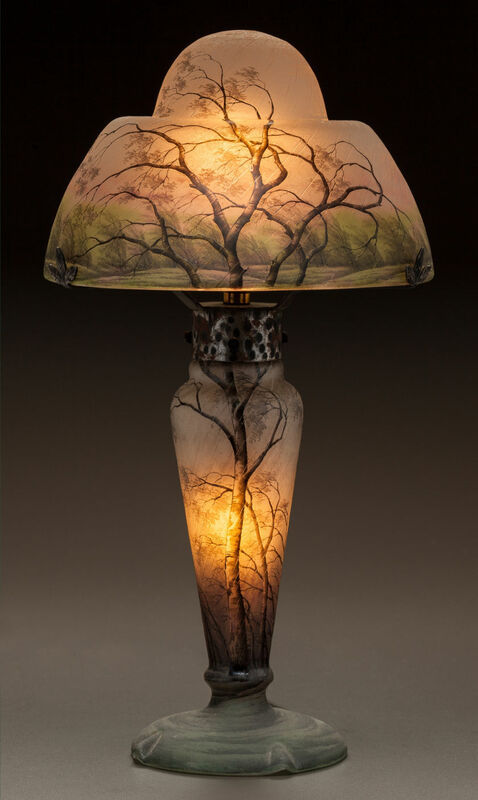 French glass sold well, led by lot #3269, a Daum Nancy Rain scenic lamp. It sold near its high estimate of $30,000, realizing $36,735. More than a few items sold near or above their high estimates. The Tiffany glass and lamps section of the sale was not ebullient, but I think it was mainly due to aggressive estimates and reserves, many of which ventured into the retail price area. Everyone wants to feel like they’re in the game, so low estimates and reserves always generate the most activity, excitement, and high prices. But that requires a gamble on the part of the consignor and unfortunately, not many consignors are gamblers. It’s the bane of the auction business — trying to get fresh, high-quality items, at reasonable estimates and reserves.